The New Missal is being reprinted. And Archbishop Galantino announced that in this new liturgical book there will be a new translation of the Our Father (http://www.lastampa.it/2018/01/25/vaticaninsider/ita/news/galantino-anche-a-messa -the-new-translation-of-our-father-I82SzuswzALqWpyICjXdiL / page.html). That therefore it will be obligatory to recite at every Mass with the novelty "and not to abandon us to temptation", instead of "and not lead us into temptation". We have broadly treated the theme highlighting the absurdity of this new translation COMPLETLY INCORRECT (https://anonimidellacroceblog.wordpress.com/2017/11/14/il-caso-della-scandalosa-nuova-traduzione-del-padre-nostro- in the-bible-cei-completely-wrong-I-explain-why-notes-for-who-does-the-small-hours-of-between-christopher /, https://anonimidellacroceblog.wordpress.com/2017/12 / 06 / Bergoglio-will change-the-father-our-course-with-the-wrong-translation-of-one-cristoforo /). But evidently this culture does not win in this neochiesa. Truth does not win. 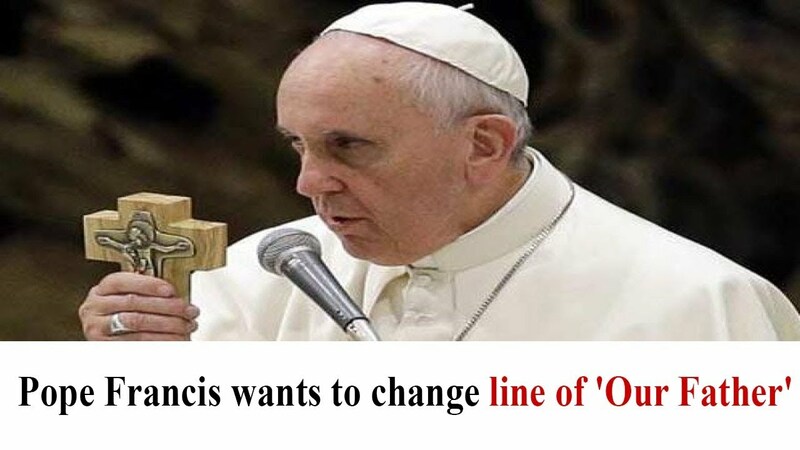 Only what Bergoglio says is worth. Right or wrong it is. Rather. Especially if it's wrong. P.S. They tell me that this New Missal must be ready by May. Does anyone have any news? Iiijs thiiij perhaps the sneaky way of getting people to pledge allegations to francic'smagesterium? It's ridiculous and blasphemous. Who Francis and Marx think to have authority over God? One man and one woman marriage and Lord prayer are Jesus' teachings that never been changed. These satanic agents have always wanted to confuse the faithful Catholics that God has made a lot of mistakes and If God made mistakes there would be no God. Why Francis and his minions attack everything related to Jesus Christ? Because they're carrying Lucifer's agenda to extinct the Roman Catholic Church which is a salvation only way. Very soon they will be rooted out and the prince of darkness will come to take them away. Pride makes them so stupid and blind. God is invincible! That's what I've been thinking....just keep using the real, old Our Father. Is there some special significance with the choice of May??? I am going to continue to my dying day to say the Our Father the way I have ALWAYS said it. I believe that Francis is the Anti-Pope! I WILL NEVER follow him! The way the frase in English os said does not seam correct. In Portuguese it says nao nos deixei cair em tentacao which the translation is; Let us not fall into temptation...let to lead are totally different. God do not lead anyone into temptation, satan does. Looks like we'll be changing the Gospel of Matthew as well. To be His friends everyone has to prove being faithful to pass all the tests. Don't want to take entrance exam, fine. There is an easy and broad way waiting. i believe God doesn't lead his people to temptation, nor to sin. He abandons those who have sinned. so for a sinner to pray do not 'abandon us to temptation' is asking God not to leave him for he will fall into temptation and may eventually sin again. 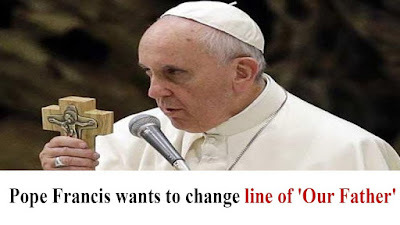 We are already warned the consequences of changing even one word of the Holy Gospel and so nobody, not even a pope has the right to change the Gospel or the words of Christ. Or to decide we just don't like it or disagree with it on some pretext. Oh Mary conceived without sin pray for us who have recourse to thee! Galathiana 1: verses 8-10. But though we, or an angel from heaven, preach a gospel to you besides that which we have preached to you, let him be anathema. As we said before, so now I say again: If any one preach to you a gospel, besides that which you have received, let him be anathema. For do I now persuade men, or God? Or do I seek to please men? If I yet pleased men, I should not be the servant of Christ.